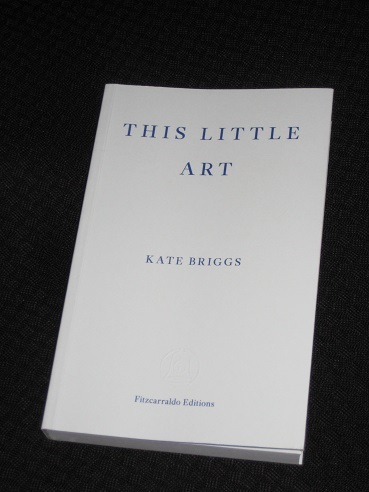 This Little Art (review copy courtesy of the publisher) is Kate Briggs’ lengthy attempt at getting to the bottom of the mysteries of translation. The title is provided by Helen Lowe-Porter, the first translator into English of much of the work of Thomas Mann, and this almost dismissive description of her own work is one that has followed translators around for some time. In order to dispel any myths and provide clarity for the uninitiated, Briggs sets out to examine what exactly it is translators do, and why. Lowe-Porter’s relationship with Mann and his work is one of several topics Briggs returns to throughout This Little Art, with this strand of the essay helping to examine some of the criticism translators face. One area focused on is attacks by certain experts on Lowe-Porter’s translations of books like The Magic Mountain, many of which see her work as incompetent. Briggs carefully examines whether in fact the critics are being too narrow in their views and failing to take into account the bigger picture (at which point many people will inevitably be reminded of recent comments regarding the translation of a certain Korean novel…). It’s not quite that I am thinking, when I read Barthes’s address in English, that this is all exactly as it should be. It’s more that when it comes to writing and reading translations the question of what is wholly normal or truly plausible, of what was really said or written, gets suspended, slightly. The translator asks me to agree to its suspension. To suspend, or suspend even further, my disbelief. This can’t really have been what he said (Barthes spoke in French; he claimed to barely speak English at all); nevertheless, I’ll go with it. A lengthy debate on whether reading the translation means reading the book ends with Briggs deciding that it’s really a moot point anyway if you can’t understand the source language. And it’s here that she moves away from what we’re expecting. Among her personal anecdotes of dance classes and professional dilemmas, she provides stories of other people’s efforts. There’s a conversation with a mum back-translating a Harry Potter novel from French to English just to see how her efforts compare with the original, and stories of a group of friends catching up to translate Dutch stories, just for fun. Briggs is at pains to stress that translation isn’t limited to a paid vocation, but an enjoyable activity that anyone can try their hand at. This Little Art is a fairly extended look at the topic of translation, with its seven broadly thematic sections each circling around a topic. However, it’s a fairly easy read because of the shortish sections (and a whole lot of blank spaces, too). Briggs has a style of her own, breathless and flighty, with a mix of long and short sentences, and she never shies away from inserting herself into the text. There’s a lot to enjoy here, even if I would have appreciated a few more insights and a little less vagueness; however, this (as is laid out in the last sentence of the book!) is a deliberate approach. While Briggs rarely falls into the trap of becoming overly defensive of translators, there is a subtle rejection of any dogmatic guidelines regarding what a translation should be underlying the whole essay. This is unsurprising, and laudable, yet I’m not sure I always agree. I’m a little hesitant to go along with a ‘you can’t criticise translations’ attitude; if you put yourself out there, take money and expect people to pay to see what you’ve done with the book, criticism is expected, and necessary. Overall, though, This Little Art is an entertaining read, well written and with enough of a blend of the personal and professional to suit a variety of readers. It serves as a reminder of the difficulties involved in translation, but also of the benefits those practising it enjoy, even if by doing so they open themselves up to criticism. But that’s what Lowe-Porter’s little art is all about, taking on a text and then letting the world tell you what they think about it (no matter how ill-informed they are). Not technically at all – you’re a really good published translator! This sounds interesting and I had already noticed it was about (unsurprisingly I suppose), but it also sounds perhaps a little slight. Where was Briggs on the Kang translation? Was the the one who criticised it for innaccuracy? If so, how does that fit with her arguing that translation is a broad church?